A reboot of the first dedicated Ableton Live controller brings with it many welcome improvements. AKG’s new 2.4GHz wireless system is easy to use, affordable, and incorporates some crafty anti-dropout technology. Auto-Tune is said to be the biggest-selling plug-in of all time. How does the new version shape up against the competition? Flux FX ambitious iOS guitar effect processor. Cubase iC Pr controller app. Though the headline features are aimed at dance producers, Apple’s latest Logic update has something for everyone. And it’s free! This all-analogue compressor-gate promises versatile utility for the budget conscious. The market for valve mics has changed a lot over the years. Has A–T’s rebooted classic got what it takes to keep up? Scream contains vocal samples from six different singers — two male and four female. Learning Cycling ’74’s Max presents a challenge even if you’re used to other music software. Is this new version easier to get to grips with? It’s billed as a ‘digital delay with an analogue heart’ but does this compact device offer anything you can’t already get in the box? With the DAW wars heating up, how are the major players tempting new users to buy into their wares? With variable power and software control this tube amp seems to promise all things to all guitarists. Does it deliver the goods? The latest version of iZotope’s RX adds some interesting features — but do they have musical applications? Sixteen years after the first one was released, Korg have completely revised and redesigned the Electribe. Livid Instruments’ Guitar Wing might not get your Telecaster airborne, but it could be its perfect MIDI controller partner. Getting their dark dirt on are the Loopmasters with this set of Neuro drum & bass samples. Offering flawless audio quality, could these prove the perfect partner to your high-end passive monitors? Over almost a decade, Pianoteq has gone from strength to strength. Version 5 offers astonishing realism with remarkably low CPU and hard-drive requirements. It’s becoming ever more important to monitor the loudness of music mixes, and Nugen Audio’s MasterCheck makes it easy. With two thirds of a Radial channel strip available at this price, is there anything not to like? The Ultimate Bundle is a collection of 20 Sounds Of Revolution (SOR) sample libraries, all of which are the work of German sound designer Oliver Schmitt. 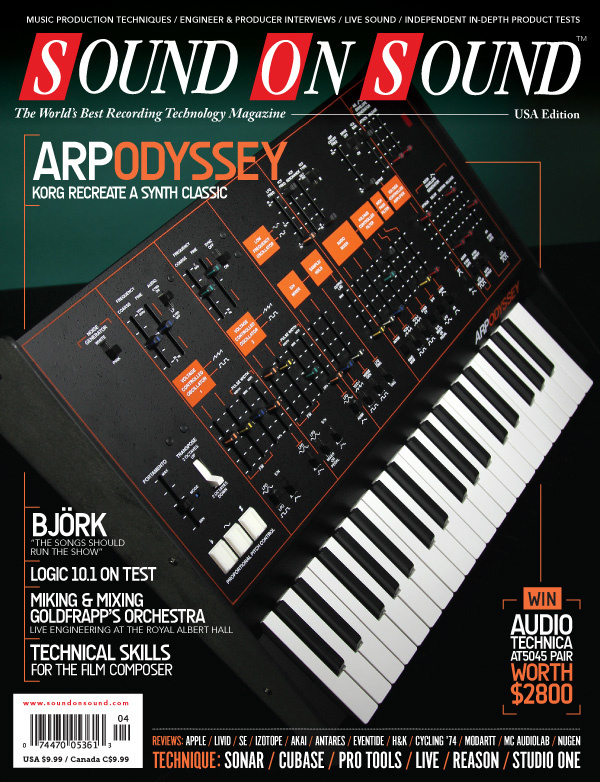 These files accompany the Sample Shop articles in the April 2015 issue. SE’s partnership with Rupert Neve has yielded this impressive new transformer-equipped microphone. We put it to the test. If your audio is soiled, SoundSoap 4 offers new tools to restore it to gleaming whiteness. This quality guitar amplification system combines the convenience of a soundhole pickup with the realism of a microphone. Rupert Neve’s processors now have plenty of admirers — and imitators. Does this one offer anything extra? Audio examples to accompany the article. We explore the hidden depths of Live’s Impulse sample player. A unique and inspired choice of collaborators helped Björk blend powerful emotion with restless experimentation. Learn how to mimic the immediacy of a hardware drum machine in Reason. The Woodleys: our engineer treats a modern band to a vintage sound. Recording Percussion: Our engineer navigates past the potentially painful pitfalls of recording the humblest of percussion instruments. Get the best possible results from AudioSnap in Sonar. Want to write music for picture? To deal with tight deadlines, multiple rewrites and ever-changing picture edits, you’ll need to be on top of the technical requirements of the job. Use your Cubase reverbs as spot effects. We present five easy ways to fatten up your bass lines in Studio One. We examine the production of some recent hits to help you brush up on your listening skills. André Rieu, J.Cole, Band Aid 30, St.Vincent, Erica Campbell. This month's Classic Mix - Bridge Over Troubled Water. Understanding Pro Tools’ automation is the key to unlocking its mixing power. The world is full of questions, ranging from the really big ones, such as ‘Is life really just software running on a computer made of meat? Mixing a band like Goldfrapp is challenging enough — but when you add an orchestra, a 50–piece choir and a notoriously tricky venue, things really start to get interesting. Producer JR Rotem is no stranger to success but, until 'Centuries', it was confined to pop and urban genres. We find out how the song was constructed and walk through the session files. Sounding Off: Is Online Collaboration A Good Idea? Mark Wherry discusses the point. Read more about Sounding Off: Is Online Collaboration A Good Idea? Q. What does an API 2500 compressor’s ‘Thrust’ control do? Q What does an API 2500 compressor’s ‘Thrust’ control do? Read more about Q. What does an API 2500 compressor’s ‘Thrust’ control do? Q. What’s the best way to downsample? Q What’s the best way to downsample when working at 24-bit and 96kHz? Read more about Q. What’s the best way to downsample? Q. Why use two top-snare mics? Normally you would use one on top and the other underneath, but in this instance both mics were used on top. Read more about Q. Why use two top-snare mics? Opportunities to spread your creative wings can arise in the most unlikely jobs. Plenty of industries use tax incentives to lure customers, but will it work for music production? This month we take a look inside Estudio Panda, located in the Argentine ‘federal capital’ Buenos Aires. Media content for the April 2015 issue.